Today, most rail transport in the United States is based in freight train shipments. Changing U.S. economic needs and the rise of bus transport due to various reasons — including, some allege, the Great American Streetcar Scandal — led to repeated convulsions in the U.S. passenger-rail industry. 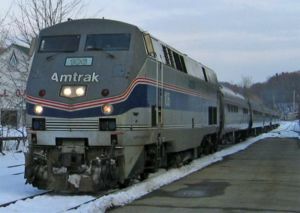 The sole nationwide passenger-rail carrier is currently Amtrak, and commuter rail systems exist only in a few pockets of the country and are not usually extensively interconnected. The most notable exception to this general rule is New York City, with its extensive subway system, the Long Island Rail Road, and the Metro-North rail extending into Connecticut with links through New Jersey Transit, and the Southeastern Pennsylvania Transit Authority to points as far south as Wilmington, Delaware. About two-thirds of all U.S. passenger rail riders, and one in every three U.S. mass transit users, lives in New York City; for more on that phenomenon, see Transportation in New York City. Chicago has a similar but smaller Metra system. U.S. railways carried 427 billion ton-miles of cargo annually in 1930. This increased to 750 billion ton-miles by 1975 and had doubled to 1.5 trillion ton-miles in 2005. In the 1950s, the U.S. and Europe moved roughly the same percentage of freight by rail; but, by 2000, the share of U.S. rail freight was 38% while in Europe only 8% of freight traveled by rail. In 1997, while U.S. trains moved 2,165 billion ton-kilometers of freight, the 15-nation European Union moved only 238 billion ton-kilometers of freight. Railroad companies in the United States are generally separated into three categories based on their annual revenues: Class I for freight railroads with annual operating revenues above $277.7 million (2004 dollars), Class II for freight railroads with revenues between $10 million and $50 million in 1978 dollars, and Class III for all other freight railroads. These classifications are set by the Association of American Railroads. In 1939 there were 132 Class I railroads. Today, as the result of mergers and bankruptcies, there are only seven railroads operating in the United States that meet the criteria for Class I. Although Amtrak qualifies for Class I status under the revenue criteria, it is generally not considered a Class I railroad because it is not a freight railroad. As of 2003, there were 141,961 miles (228,464 km) of standard gauge rail tracks in the United States. Numerous short lines were built, especially in the south, to provide connections to the river system. From 1829-1830, the Tuscumbia-Courtland-Decatur Railroad, the first railroad constructed west of the Appalachian Mountains, was built connecting the two Alabama cities of Decatur and Tuscumbia. The Pontchartrain Rail-Road, a 5-mile route connecting the Mississippi River with Lake Pontchartrain at New Orleans, Louisiana was completed in 1831, starting over a century of operation. Soon, other roads that would themselves be purchased or merged into larger entities, formed. The Camden and Amboy Railroad, the first railroad built in New Jersey, completed its route between its namesake cities in 1834. The C&A eventually became part of the Pennsylvania Railroad. The First Transcontinental Railroad in the United States was built across North America in the 1860s, linking the railway network of the eastern U.S. with California on the Pacific coast. Finished on May 10, 1869 at the famous Golden spike event at Promontory Summit, Utah, it created a nationwide mechanized transportation network that revolutionized the population and economy of the American West, catalyzing the transition from the wagon trains of previous decades to a modern transportation system. Although an accomplishment, it achieved this claim of being the first transcontinental railroad by connecting a myriad of eastern US railroads to the Pacific. Nonetheless, it was not the largest railroad system in the world. The Canadian Grand Trunk Railway (GTR) had, by 1867, already accumulated more than 2,055 km (1,277 miles) of track by connecting Portland, Maine, and the three northern New England states with the Canadian Atlantic provinces west as far as Port Huron, Michigan, through Sarnia, Ontario. Authorized by the Pacific Railway Act of 1862 and heavily backed by the federal government, it was the culmination of a decades-long movement to build such a line and was one of the crowning achievements of the presidency of Abraham Lincoln, completed four years after his death. The building of the railway required enormous feats of engineering and labor in the crossing of plains and high mountains by the Union Pacific Railroad and Central Pacific Railroad, the two federally chartered enterprises that built the line westward and eastward respectively. The building of the railroad was motivated in part to bind the Union together during the strife of the American Civil War. It substantially accelerated the populating of the West by white homesteaders, led to rapid cultivation of new farm lands. The Central Pacific and the Southern Pacific Railroad combined operations in 1870 and formally merged in 1885; the Union Pacific originally bought the Southern Pacific in 1901 and was forced to divest it in 1913, but finally took it over for good in 1996. Much of the original right-of-way is still in use today and owned by the modern Union Pacific Railroad, which is descended from both of the original railroads. As early as the 1930s, automobile travel had begun to cut into the rail passenger market, somewhat reducing economies of scale, but it was the development of the Interstate Highway System and of commercial aviation in the 1950s and 1960s that dealt the most damaging blows to rail transportation, both passenger and freight. There was little point in operating passenger trains to advertise freight service when those who made decisions about freight shipping traveled by car and by air, and when the railroads' chief competitors for that market were interstate trucking companies. Soon, the only things keeping most passenger trains running were legal obligations. Meanwhile, companies who were interested in using railroads for profitable freight traffic were looking for ways to get out of those legal obligations, and it looked like intercity passenger rail service would soon become extinct in the United States beyond a few highly-populated corridors. The final blow for passenger trains in the U.S. came with the loss of railway post offices in the 1960s. Freight transportation continued to labor under regulations developed when rail transport had a monopoly on inter-city traffic, and railroads only competed with one another. An entire generation of rail managers had been trained to operate under this regulatory regime. Labor unions and their work rules were likewise a formidable barrier to change. Overregulation, management and unions formed an "iron triangle" of stagnation, frustrating the efforts of leaders such as the New York Central's Alfred E. Perlman. In particular, the dense rail network in the Northeastern U.S. was in need of radical pruning and consolidation. A spectacularly unsuccessful beginning was the 1968 formation and subsequent bankruptcy of the Penn Central, barely two years later. Historically, on routes where a single railroad has had an undisputed monopoly, passenger service was as spartan and as expensive as the market and Interstate Commerce Commission regulation would bear, since such railroads had no need to advertise their freight services. But on routes where two or three railroads were in direct competition with each other for freight business, such railroads would spare no expense to make their passenger trains as fast, luxurious, and affordable as possible, because it was considered to be the most effective way of advertising their profitable freight services. The National Association of Railroad Passengers (NARP) was formed in 1967 to lobby for the continuation of passenger trains. Its lobbying efforts were hampered somewhat by Democratic opposition to any sort of subsidies to the privately owned railroads, and Republican opposition to nationalization of the railroad industry. The proponents were aided by the fact that few in the federal government wanted to be held responsible for the seemingly-inevitable extinction of the passenger train, which most regarded as tantamount to political suicide. The urgency of the need to solve the passenger train problem was heightened by the bankruptcy filing of the Penn Central Transportation, the dominant railroad in the Northeast U.S., on June 21, 1970. Participating railroads bought into the new corporation using a formula based on their recent intercity passenger losses. The purchase price could be satisfied either by cash or rolling stock; in exchange, the railroads received Amtrak common stock. Any participating railroad was freed of the obligation to operate intercity passenger service after May 1971, except for those services chosen by the Department of Transportation as part of a "basic system" of service and paid for by NRPC using its federal funds. Railroads who chose not to join the Amtrak system were required to continue operating their existing passenger service until 1975 and thenceforth had to pursue the customary Interstate Commerce Commission (ICC) approval process for any discontinuance or alteration to the service. The original working brand name for NRPC was Railpax, it was changed to Amtrak. At the time, many Washington insiders viewed the corporation as a face-saving way to give passenger trains the one "last hurrah" demanded by the public, but expected that the NRPC would quietly disappear in a few years as public interest waned. However, while Amtrak's political and financial support have often been shaky, popular and political support for Amtrak has allowed it to survive into the 21st century. Much for the same reasons, freight transportation deteriorated along with passenger rail. In 1974, President Nixon created a government sponsored company called Consolidated Rail Corporation from various collapsed Northeastern railroads. The freight industry continued its decline until Congress passed the Staggers Rail Act in 1980, which largely deregulated the rail industry and returned it to profitability. Every piece of railroad rolling stock operating in North American interchange service is required to carry a standardized set of reporting marks. The marks are made up of a two- to four-letter code identifying the owner of the equipment accompanied by an identification number and statistics on the equipment's capacity and tare (unloaded) weight. Marks whose codes end in X (such as TTGX) are used on equipment owned by entities that are not common carrier railroads themselves. Marks whose codes end in U are used on containers that are carried in intermodal transport, and marks whose codes end in Z are used on trailers that are carried in intermodal transport. Typically, railroads operating in the United States reserve one- to four-digit identification numbers for powered equipment such as diesel locomotives and six-digit identification numbers for unpowered equipment. There is no hard and fast rule for how equipment is numbered; each railroad maintains its own numbering policy for its equipment. The types of equipment seen in trains on American railroads are not substantially different from the types seen around the world. The AAR (Janney) coupler has been standard on North American equipment for over a century, though some car types use particular variants for operational or safety reasons. Two axle cars remain the rare exception. The basic design of a passenger car was standardized by 1870. By 1900 the main car types were: baggage, coach, combine, diner, dome car, lounge, observation, private, Pullman, railway post office (RPO) and sleeper. The first passenger cars in the resembled stagecoaches. They were short, often less than 10 ft. (3 m) long, tall and rode on a single pair of axles. American mail cars first appeared in the 1860s and at first followed English design. They had a hook that would catch the mailbag in its crook. As locomotive technology progressed in the mid-19th century, trains grew in length and weight. Passenger cars grew along with them, first getting longer with the addition of a second truck (one at each end), and wider as their suspensions improved. Cars built for European use featured side door compartments, while American car design favored a single pair of doors at one end of the car in the car's vestibule; compartmentized cars on American railroads featured a long hallway with doors from the hall to the compartments. One possible reason for this difference in design principles between American and European carbuilding practice could be the average distance between stations on the two continents. As most European railroads connected towns and villages that were still very closely spaced, American railroads had to travel over much greater distances to reach their destinations. Building passenger cars with a long passageway through the length of the car allowed the passengers easy access to the restroom, among other things, on longer journeys. Dining cars first appeared in the late 1870s and into the 1880s. Until this time, the common practice was to stop for meals at restaurants along the way (which led to the rise of Fred Harvey's chain of Harvey House restaurants in America). At first, the dining car was simply a place to serve meals that were picked up en route, but they soon evolved to include galleys in which the meals were prepared. By the 1920s, passenger cars on the larger standard gauge railroads were normally between 60 ft (18.3 m) and 70 ft (21.3 m) long. The cars of this time were still quite ornate, many of them being built by experienced coach makers and skilled carpenters. 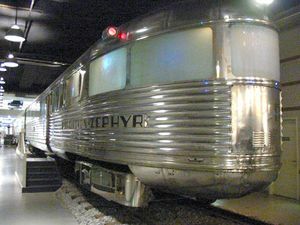 The observation car on CB&Q's Pioneer Zephyr. The carbody was made of stainless steel in 1934, it is seen here at the Museum of Science and Industry in Chicago in 2003. With the 1930s came the widespread use of stainless steel for carbodies. The typical passenger car was now much lighter than its "heavyweight" wood cousins of old. The new "lightweight" and streamlined cars carried passengers in speed and comfort to an extent that had not been experienced to date. Aluminum and Cor-ten were also used in lightweight car construction, but stainless steel was the preferred material for car bodies. It isn't the lightest of materials, nor is it the least expensive, but stainless steel cars could be, and often were, left unpainted except for the car's reporting marks that were required by law. By the end of the 1930s, railroads and carbuilders were debuting carbody and interior styles that could only be dreamed of before. In 1937, the Pullman Company delivered the first cars equipped with roomettes - that is, the car's interior was sectioned off into compartments, much like the coaches that were still in widespread use across Europe. Pullman's roomettes, however, were designed with the single traveler in mind. The roomette featured a large picture window, a privacy door, a single fold-away bed, a sink and small toilet. The roomette's floor space was barely larger than the space taken up by the bed, but it allowed the traveler to ride in luxury compared to the multilevel semiprivate berths of old. Now that passenger cars were lighter, they were able to carry heavier loads, but the size of the average passenger that rode in them didn't increase to match the cars' new capacities. The average passenger car couldn't get any wider or longer due to side clearances along the railroad lines, but they generally could get taller because they were still shorter than many freight cars and locomotives. So the railroads soon began building and buying dome and bilevel cars to carry more passengers. Carbody styles have generally remained consistent since the middle of the 20th century. While new car types haven't made much of an impact, the existing car types have been further enhanced with new technology. Starting in the 1950s, the passenger travel market declined in North America, though there was growth in commuter rail. The higher clearances in North America enabled bi-level commuter coaches that could hold more passengers. These cars started to become common in the United States in the 1960s. While intercity passenger rail travel declined in America, ridership continued to increase in other parts of the world. With the increase came an increased use of newer technology on existing and new equipment. The Spanish company Talgo began experimenting in the 1940s with technology that would enable the axles to steer into a curve, allowing the train to move around the curve at a higher speed. The steering axles evolved into mechanisms that would also tilt the passenger car as it entered a curve to counter the centrifugal force experienced by the train, further increasing speeds on existing track. Today, Talgo trains are used in many places in Europe and they have also found a home in North America on some short and medium distance routes such as Seattle, Washington, to Vancouver, British Columbia. 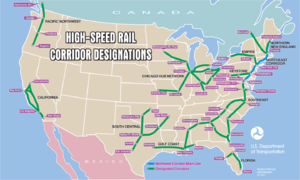 This map from 2001 shows a number of proposed high-speed routes in the U.S. Unlike in most Western European countries, in the United States high-speed rail is more a case of hope than reality. It is possible to trace the development of high-speed railways back to the streamliners that criss-crossed the United States in the 1930s, 1940s, and 1950s which, in turn, can be traced further back to the competing companies operating different routes between London and Scotland, and to railways in Germany and France. However, several factors contributed to the stagnation of rail passenger transport in the U.S., a decline which occurred just as Europe and Japan were pushing forward with new technologies. Amtrak, the only nationwide passenger rail carrier in the U.S., has been operating Acela Express trains between Boston and Washington, D.C. since 2001. These trains tilt into curves along the track, reaching a top speed of 150 mph (240 km/h). However, this maximum speed is not really considered fast enough for Acela to be genuinely called high-speed technology. The scheduled transit time for the 5:00 am departure from Washington DC arriving in Boston South Station on Acela express service is roughly 6 hours and 36 minutes. Subtracting a fifteen minute scheduled layover in New York City, the average speed is 68 mph for the 450 mi (720 km) trip. There has been a resurgence of interest in high-speed rail in the U.S. in recent decades, with many plans being examined for high–speed rail across the country. Current service, however, remains relatively limited, and is usually far more expensive than is reasonable for the average traveller. ↑ Horse-drawn rail lines were in use for short-distance hauling of stone. See Gridley Bryant. Other purpose-built railroads were operating in the 1820s. The Delaware and Hudson Canal Company, which later became the Delaware and Hudson Railroad, built its first tracks in 1826 as a gravity railroad in Carbondale, Pennsylvania, to haul coal from a mine to the canal at Honesdale. United States Central Intelligence Agency (May 17, 2005), The World Fact Book: United States. Retrieved May 26, 2005. WWW Guide to "Railroad History"
John H. White, Jr. Reference Collection, 1880s-1990 Archives Center, National Museum of American History, Smithsonian Institution. This page was last edited on 16 December 2011, at 19:57.